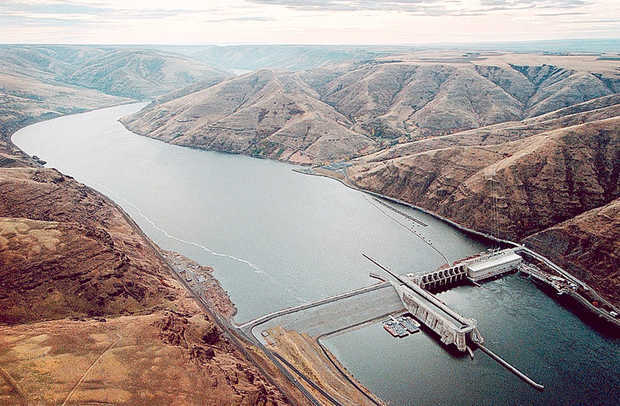 BPA normally earns from selling surplus hydropower from the Columbia River dams. Bonneville Power Administration electric rates are expected to increase again in 2018, the chief of the federal power marketing agency said Tuesday. That likely will lead to new rate increases at the Cowlitz PUD. Elliot Mainzer, BPA administrator, told PUD commissioners from Cowlitz and Lewis counties that declining natural gas prices and rising fish and wildlife conservation costs are putting pressure on the agency to raise its wholesale rates. Bonneville provides 90 percent of Cowlitz PUD's power needs, so the agency's rate increases trickle down to PUD customers. Mainzer said BPA's base rates could increase by 3 to 4 percent in the 2018-2019 rate setting cycle. Transmission rates could increase by at least 4 percent and as much as 9 percent in a worst case scenario if gas prices "continue to tank," he said. Plummeting natural gas prices have pulled down the energy market. That has decreased the revenue BPA normally earns from selling surplus hydropower from the Columbia River dams. Mainzer said the agency's revenue from surplus power sales is $100 million lower this year than originally expected. Fish and wildlife management also continues to be a big cost driver, totaling about $300 million a year. Commissioner Dena Diamond-Ott pushed Mainzer to reexamine those costs, noting that for every dollar paid by a Cowlitz PUD ratepayer, about 30 cents goes towards fish and wildlife management. "We're for the environment, we're as green as everyone else, but we just want to make sure we're getting the benefit," she said. The agency had set the a goal of capping costs for fish and wildlife after 2019. However, that plan is in jeopardy after a recent federal court ruling, Mainzer said. A federal judge in May struck down Bonneville's plan for salmon protection on the Columbia River, which was created in conjunction with four other federal agencies. The judge found the plan violates the Endangered Species Act and the National Environmental Policy Act. He ordered the agencies to develop a new plan for managing salmon on the river by next spring. Beyond fish and wildlife, BPA is continuing to look at efficiency measures and negotiate with its clients about controlling power costs, Mainzer said. Contracts with some of BPA's customers, including Cowlitz PUD, won't expire until 2028. However, utilities and customers are already looking ahead. Higher electricity costs from BPA could push large industrial clients like Weyerhaeuser Co. and KapStone Paper and Packaging Corp. to seek third-party power sources, Diamond-Ott said. "We believe these customers will very aggressively seek third power suppliers ... these parties are considering these options," Diamond-Ott said. Mainzer said he hopes to continue working with Cowlitz PUD on cost-saving measures. "I've heard you guys loud and clear. I understand the economic challenges that you're facing in your communities," Mainzer said. "We are in a period of increased costs, low commodity markets .. we'll work until our last breath to try to keep these costs as manageable as possible."